With the recent conclusion of a street art festival in Mumbai, murals and graffiti have appeared in localities across town. While Bandra and parts of Andheri are now hotspots for public street art, one could argue that there can never be too much. We took a closer look at Dharavi to understand the role that street art might play. 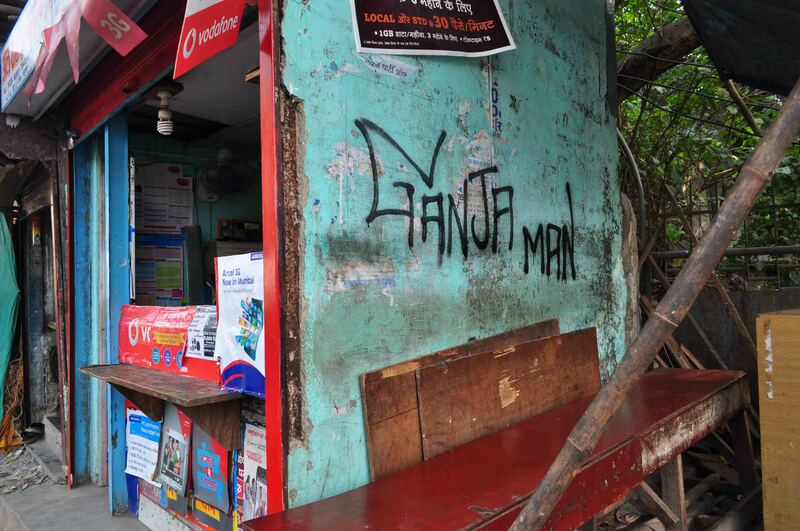 With its bustling roads and busy shops, Dharavi is a visual jungle of signboards and advertisements for businesses. Most of these are digitally produced nowadays, but a few maintain the tradition of hand-painted signage. Walk down 90 Feet Road, 60 Feet Road and the inner lanes of Mukund Nagar and Social Nagar and you are bound to spot interesting signs that could be curated as local graphic art. 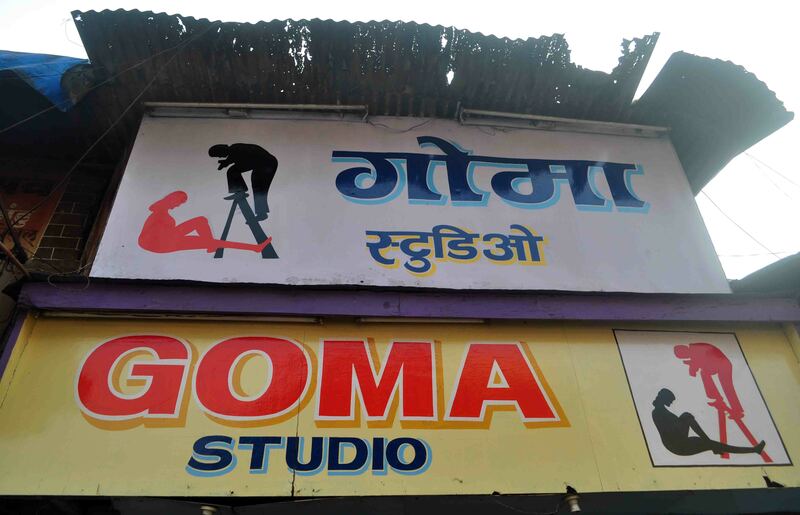 A favourite is Goma, a photography studio on 60 Feet Road, which recently got its hand-painted sign redone. With a fresh coat of glossy yellow, Goma’s sign stands out among the digital-visual noise on the streets. The owner, a digital photographer, says that he loves the natural tones of paint rather than the plastic feel of flex. 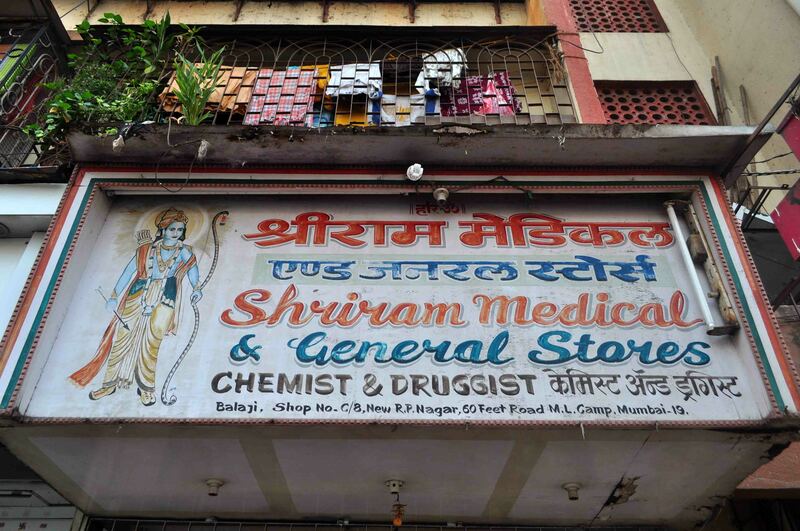 Another vibrant signboard belongs to Shriram Medical and General Stores opposite Chota Sion Hospital. It has a painting of the shop’s mascot, Shri Ram, with touches of the Indian tricolour. 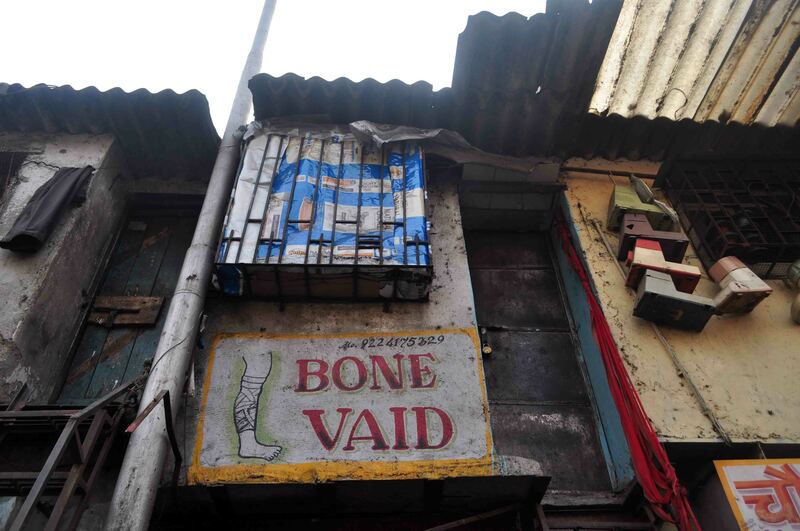 However, unique among the hand-painted signs in Dharavi are those that advertise the bone-setters, usually replete with diagrams of all the broken bones they can fix. These are unfortunately on the verge of being erased altogether, given the demand for digital prints and the decline of bone-setters. While many commercial signs use street art elements, Dharavi is till starved of “proper” street art. We were therefore pleased to see the international street artists who painted the town using diverse techniques, along with child-trainees from the SlumGods. Works by Tona, Gomez and Seikon can be seen at a community toilet in Kala Killa. Tona’s stencils, Seikon’s geometric designs and the mysterious woman by Gomez drew curious crowds who watched art come alive in a matter of minutes on their toilet walls. The largest facade of the toilet was given to Dharavi children, who were mentored earlier in the morning by Dutch artist Dann at the Colour Box. More works by the street artists on 60 Feet Road are a relief when you’re stuck in traffic. At the Dharavi Biennale we were able to seek out resident sign-painters to make a series of portraits called the Dharavi Healers. With their bold colours and raw appeal, these paintings are in signature styles reminiscent of the vivid Bollywood posters of the 1980s. The series-in-the-making will finally feature the works of five artists, all based in Dharavi and keeping the tradition alive. 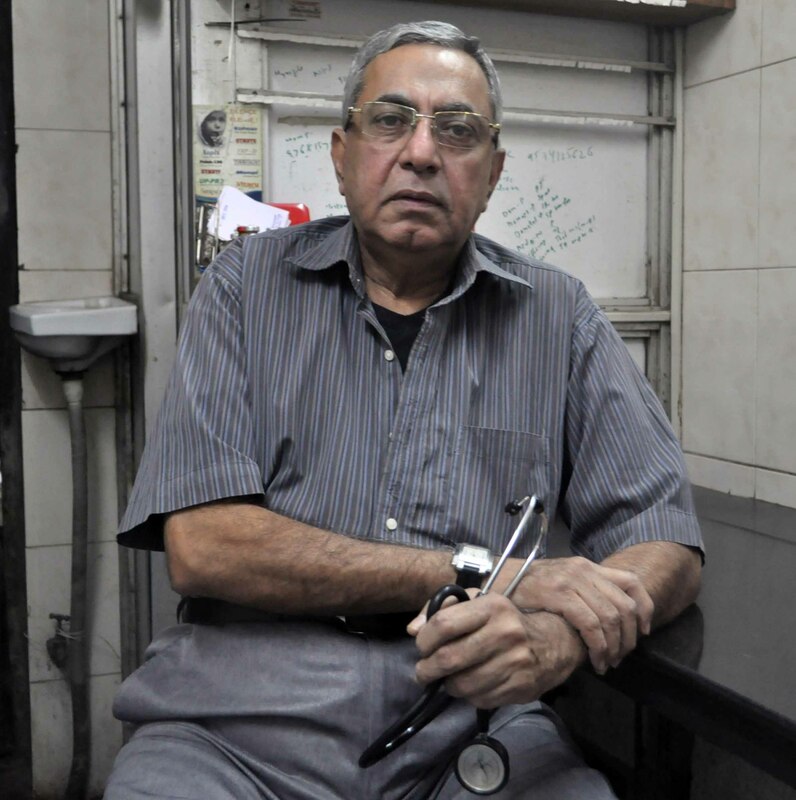 One of them, Niren Savaniya, works out of his studio in Navrang Compound and paints for a living. The studio is a low- ceilinged room with one tube-light above a steep set of stairs that cross a couple of sweatshops. Despite the circumstances, Niren is a busy artist and paint splatters on the floor are testimony to his work. He is self-taught and shows us his latest creations commissioned by a catering company. He has already painted a mural for the Dharavi Biennale with the Priya Shakti campaign, curated by Ram Devineni, which shows a heroine seated on a grand, intimidating tiger. On drawing days the public had been sceptical about his work, but Niren says that now the community takes good care of it. “Recently, five of the people who live near that mural in Kumbharwada came to me and pointed out that some vandals have destroyed the heroine’s eyes. I re-touched her eyes and she looks perfect again,” he says. Without doubt, there is a lot of potential for street art in Dharavi. Niren believes that only if you give people good public art can you expect a culture of protecting and preserving it. Unlike the well-to-do parts of Mumbai, where we have heard that residents are a tad reluctant to let their pretty walls be used for street art, most people in Dharavi are welcoming. In fact, street art here can be used to improve urban structures, adding colour, beauty and meaning to a wall. The number of urban issues that plague people might find an easy outlet through anti-establishment graffiti, but a Banksy is yet to be born in Dharavi.